Welcome to Family Psychological Press! A Whole New World of Independent Publishing! Welcome to Family Psychological Press. Our goal over the next five years is to create top quality fiction and non-fiction by professional authors with advanced degrees, interesting experiences, and strong voices; professionals who write for the families they serve. 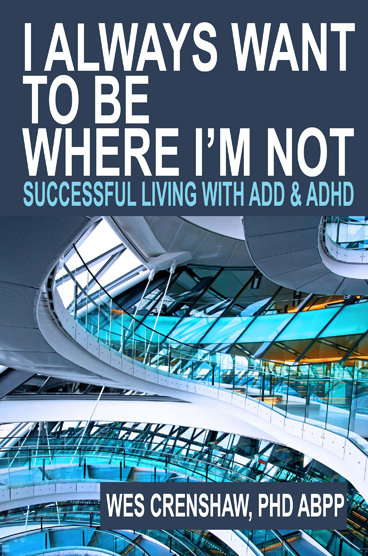 Wes Crenshaw, PhD, Board Certified Couples and Family Psychologist (ABPP), offers thirteen principles for living with ADD and ADHD drawn from twenty-two years of experience and 23,000 hours of clinical conversation. Written in an entertaining, conversational style for readers aged fifteen and up, Dr. Wes pulls no punches in confronting the cognitive, social, emotional, and academic pitfalls people with ADD face every day. He also helps families, friends, and romantic partners understand a diagnosis of ADD not as an excuse for difficulties, but as a first step on the path to a better tomorrow. Dr. Wes's principles include accepting here and now, living intentionally, making mindful decisions, recognizing and taking the right path and not just the easy one, wanting rather than wishing, finding and following life's instructions, managing crises, taking responsibility, attaining character through radical honesty, and creating sustainable happiness through organized thinking and living. Finally, Dr. Wes guides you and your loved ones in how to better manage relationships, seek a good diagnosis, utilize therapy, and become your own expert on medication management. * Have you been diagnosed with ADD or ADHD or do you suspect you should be? Do you really want to start solving your many riddles and living a more successful and productive life? This book is for you. * Does your partner, child, roommate, or friend have ADD? Do you wonder what's going on in his or her head, and you really want to understand the secret code so you can better love him or her? This book is for you. *Stamp out Spam. Cut, paste and change [at] to @ in your email program.